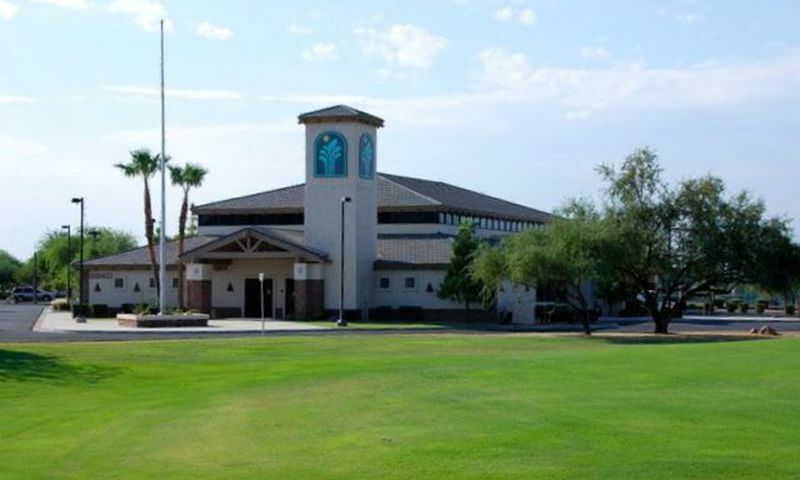 Sunland Springs Village in Mesa is an active adult golf community east of Phoenix. Ideally situated near the Superstition Freeway (60), access to Phoenix and the surrounding attractions of the East Valley is quick and easy. This semi-customizable community is favored by buyers looking to escape the mainstream adult communities dotted throughout the Phoenix valley. Residents of Sunland Springs Village enjoy the community's close proximity to the nearby Superstition Gateway shopping plaza that is home to many big name stores and specialty shops. In addition, great restaurants, a movie theater and other unique retail establishments are a short drive from home. There is a great lineup of top-notch amenities at Sunland Springs Village. The Recreation Center is a large amenity center that has almost everything you'll need on a daily basis. Everyday, residents can be found soaking up the sun near the two outdoor pools or staying active playing tennis, pickleball, volleyball and softball. The community's 27 holes of golf are ideal for residents who want to play an occasional round of inexpensive golf but who are not looking for a championship course. With a card room, library, woodworking shop, and ballroom Sunland Springs Village hosts many activities for all your interests. The developer of Sunland Springs Village prides itself on quality construction. Many homes are constructed with block walls or 2x6 frame construction. In addition, home buyers can partially or fully customize their homes. The result is a community with a distinctive look that is different from some of the more cookie-cutter communities of the area. Single-family homes with low association fees are available at modest prices and range in size from around 1,100 to over 3,200 square feet. Buyers looking for more low-maintenance, turnkey homes might opt for a townhome or golf condo available from 1,000 to 1,700 square feet. There are over 40 clubs and interest groups at Sunland Springs Village representing everything from cards and crafts to biking and hiking. Plus, a full-time activities coordinator is continually arranging fun and exciting classes, activities and events to ensure the residents of Sunland Springs Village have the opportunity to live a physically active and socially engaging lifestyle. Sunland Springs Village is located in a much sought-after location in Mesa, Arizona. The East Valley of the Phoenix Metro area is a popular location for active adults and retirees from all over. Superstition Gateway is a shopping plaza situated adjacent to the Sunland Springs Village. With big-name stores like Kohls, Wal-Mart, Best Buy, Ross, Staples, and Bed Bath & Beyond it's easy to get your everyday needs. Also located here are many specialty shops and services including banks, restaurants, IMAX Theater, and LA Fitness. Situated just a mile away, Highway 60 allows residents to easily drive to Phoenix Sky Harbor Airport and Phoenix-Mesa Gateway Airport. Sunland Springs Village is a vibrant 55+ community that has an envious lineup of amenities, nearby conveniences, and low-maintenance homes in Central Arizona. Auditorium - 13,000 Sq. Ft. There are plenty of activities available in Sunland Springs Village. Here is a sample of some of the clubs, activities and classes offered here. The golf condos are single-level attached homes that are 1,492 to 1,705 square feet in size. These homes offer two or three bedrooms, two bathrooms, and an attached two-car garage. The two townhome floor plans offer one or two bedrooms, two bathrooms, and an attached two-car garage. These are 1,064 to 1,371 square-foot residences. There are seven single-family home floor plans that range from 1,187 to 2,315 square feet in size. These ranch homes offer one to four bedrooms, two or two-and-a-half bathrooms, and a two to three-car garage. My wife and I just moved in to a home here and we feel like we got an amazing deal! Right on the golf course, almost 2,000 square feet and for just over $300k. The monthly fees aren't bad either. So far I've spent a lot of time on the golf course but I have plans to check out some of the clubs this summer. My wife has been busy with dance classes and joined a book club so she's very happy here. You know what they say, happy wife, happy life! 55places.com is not affiliated with the developer(s) or homeowners association of Sunland Springs Village. The information you submit is distributed to a 55places.com Partner Agent, who is a licensed real estate agent. The information regarding Sunland Springs Village has not been verified or approved by the developer or homeowners association. Please verify all information prior to purchasing. 55places.com is not responsible for any errors regarding the information displayed on this website.